A friend once quipped that, given my reluctance to hand out four stars to more than just a couple of movies each year, I only award the highest rating if I "personally see God walking across the auditorium." Honestly, he's not far off when it comes to the magnificent new movie Arrival. While there may have been no divine presence in the theater, there was certainly a religious movement taking place on the screen. A motion picture that turns out to be far more focused on humanity than on otherworldly visitors, it's a transcendent viewing experience that gets under the skin and into the heart. As a bonus, it's also the right movie at the right time. In an election week which saw millions of gullible Americans embrace transparent evil, ignorance and bigotry, here's a welcoming film that celebrates the best among us, those who gaze open-eyed at the horizon and invite the unknown rather than recoil from it. In Arrival, the heroes are the visionaries who throw open their arms to embrace the aliens who have entered our borders, not the weaklings who seek to repel them with walls, weaponry or what-have-you. 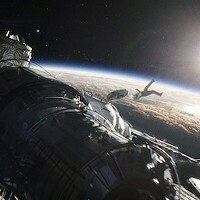 Presented in a fragmented manner that perpetually keeps viewers off balance, the film centers on Louise Banks (Amy Adams), a college professor and linguist who's approached by the military (repped by Forest Whitaker) to help communicate with the extra-terrestrials whose enormous ships have taken root at 12 spots across the globe. Louise and scientist Ian Donnelly (Jeremy Renner) are transported to the one vessel that's stateside, whereupon they seek to decipher the inky blots (basically Rorschach meets Ringu) squirted from the aliens' appendages. Meanwhile, other colleagues and other countries (particularly China) are growing more nervous by the minute, convinced that the invaders are of the Independence Day variety and are planning to decimate at will. For her part, Louise is filtering everything through scattered memories, most focusing on her young daughter. 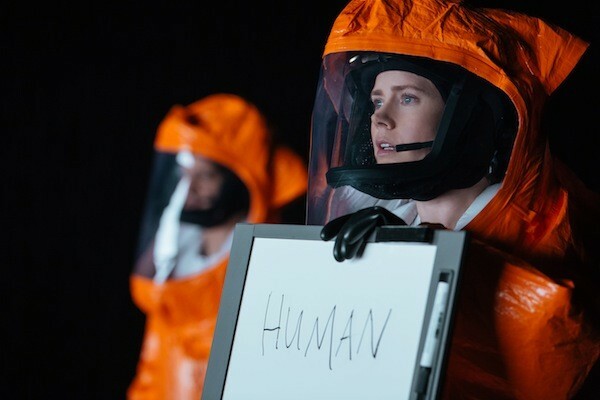 Arrival is based on Ted Chiang's short piece "Story of Your Life," the type of work that sounds unfilmable. Yet scripter Eric Heisserer (who before now was best known for penning the lamentable remake of A Nightmare on Elm Street and the lamentable prequel to The Thing) has contributed a screenplay that's both literate and lyrical, one that moves with grace and provides plenty of catharsis along the way. Director Denis Villeneuve, who's about to have his third consecutive feature land in my year-end Top 12 (his last two gems were Sicario and Prisoners), never overplays his hand, and he requests the same from others working on this production. The visual effects are magnificent but never in your face, and while it's apparent that the score comes from the same guy who crafted the superb one for Sicario, composer Jóhann Jóhannsson nevertheless uses the nerve-jangling refrains more sparingly, mixing it up with calmer if still somber stretches. Adams is excellent in the central role, a part not unlike the one essayed by Sandra Bullock in Gravity. Indeed, Arrival stirs memories of several heady sci-fi outings, among them Gravity, Interstellar, Contact and, of course, Close Encounters of the Third Kind. I'm not going to allow my adoration to render me so flippant as to idiotically state that it makes all those A-games look as insipid as The Adventures of Pluto Nash by comparison, but in many ways, it really is in a class by its beautiful self.